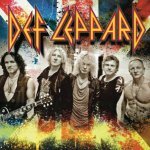 Def Leppard played a show in Madrid, Spain on 26th June and a fifth online review and photos have been posted. Heavy Metal have posted a review of the show which took place at the Palacio Vistalegre Arena. A gallery of 52 photos are also included. "The ... DEF LEPPARD. Majestic, immense, light as a feather. GOOD MORNING FREEDOM is the forerunner, followed by ACTION and FO FO FO fooling."